Kearney, T.C., M. Keith and E.C.J. Seamark. 2016 (for 2017). 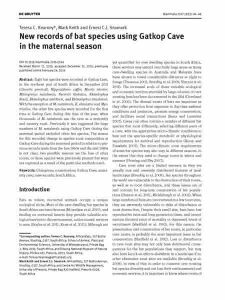 New records of bat species using Gatkop Cave in the maternal season. Mammalia. 81(1): 41-48. doi: 10.1515/mammalia-2015-0043. Eight bat species were recorded at Gatkop Cave, in the northern part of South Africa in December 2011 (Cloeotis percivali, Hipposideros caffer, Myotis tricolor, Miniopterus natalensis, Nycteris thebaica, Rhinolophus blasii, Rhinolophus smithersi, and Rhinolophus simulator). With the exception of M. natalensis, R. simulator and Myo. tricolor, the other five species were recorded for the first time at Gatkop Cave during this time of the year, when thousands of M. natalensis use the cave as a maternity and nursery roost. Previously it was suggested the large numbers of M. natalensis using Gatkop Cave during the maternal period excluded other bat species. The reason for this recorded change in species roost composition at Gatkop Cave during the maternal period in relation to previous records made from the late 1960s and the mid 1980s is not clear, two possible reasons are the loss of other roosts, or these species were previously present but were not captured as a result of the particular methods used.